A lovely friend has just returned to Indonesia after a year away. As it was her birthday a few days ago I decided to ask her what she would like me to make for her as a gift. Thankfully she didn't choose a King-sized quilt! She asked for a tote bag. Simple right? I think it is just my state of mind at the moment, but I could not decide on a design or pattern. Half the problem is that most bags require some sort of interfacing, and that is not readily available here. So I have to check whether I have in my stash what the pattern requires, or whether I can improvise. I finally decided on Noodlehead Designs 'Go Anywhere Bag'. 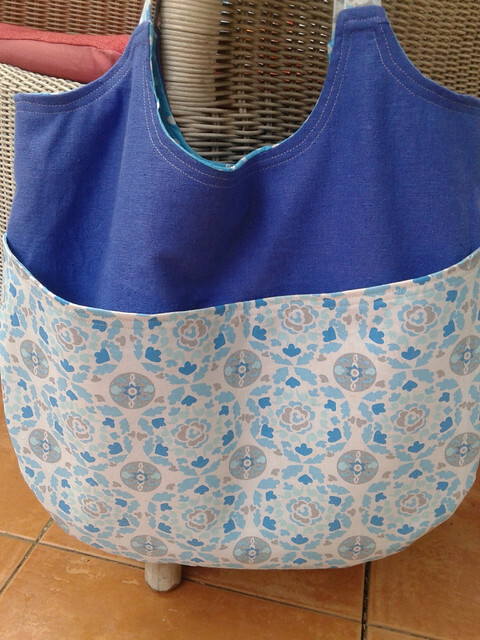 Not your usual tote shape, but a large bag with lots of pockets, and not too complicated (I had seriously run out of time by this stage!). 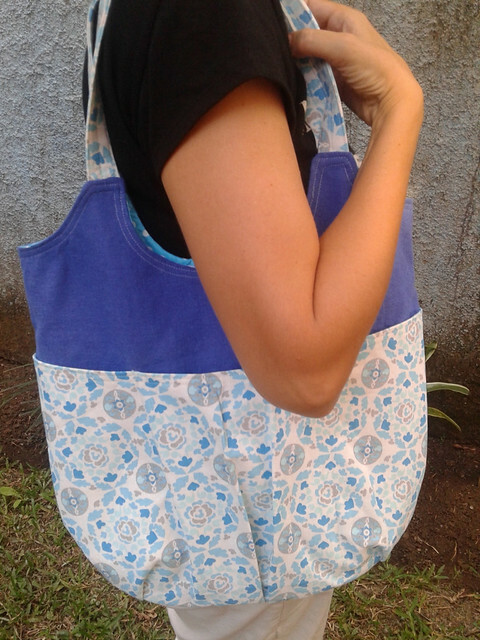 I chose some Dena designs linen blend fabric for the front and back pockets, and an open weave linen/cotton blend for the main section of the bag. I used a heavier weight interfacing for the pockets, and a medium weight interfacing for the main section (heavier weight would have been better for this but I had run out!). I skipped the magnetic snaps and just used some velcro on the large back pocket and left the main section of the bag open. Once all the pieces had been cut and interfaced, this bag came together really quickly, and the pattern was very easy to follow. 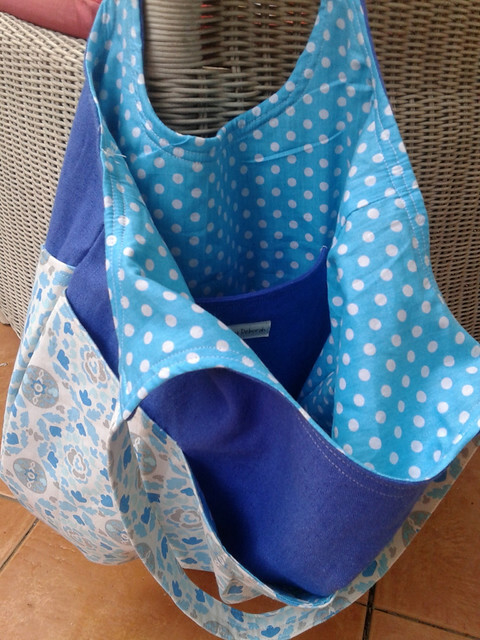 I love the polka dots I used for the lining, and even remembered to add my label to the inside pocket! The main thing I will watch out for next time round is to get the back and front pockets lined up better, but it is hardly noticeable, and my friend was really happy with it. 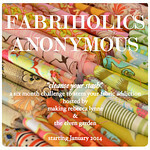 Linking up with TGIFF and Finish It Friday. "and my friend was really happy with it" - now that's the perfect ending! Good to know this pattern is easy to make and the velcro may well work better than a snap anyway. I love the polka dot interior too! How awesome that your friend was happy with it - that is the best part of all! Lovley bag! We're doing tote bags for a summer swap in our online guild and I'm hoping to use Noodlehead Super Tote pattern - they are really well written! Such a cute bag! I haven't been in the mood to make a bag recently but this pattern has always been on my *someday maybe* list. Great fabric choices. You can't buy interfacing? Maybe I need to remedy that- can I send you a metre or so? Lovely bag, by the way! I'm taking part in the same swap as Ruth above snd am seriously admiring your bag . Where you say quick I'm thinking simple . And so quick equates to not too difficult I'm thinking ? 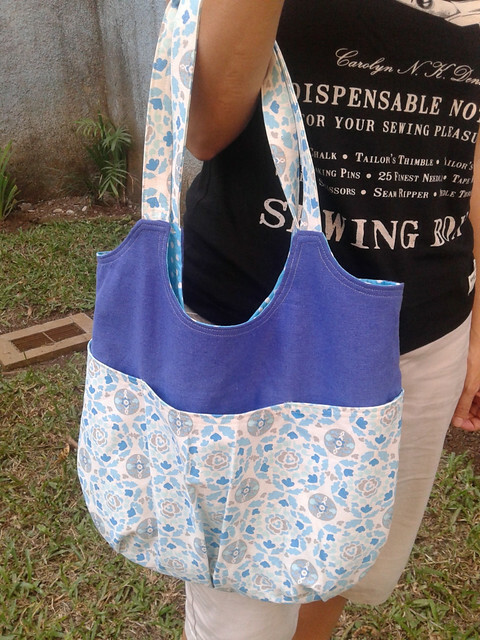 that's a beautiful bag, I love the fabric you've chosen for the front. awwhhh...you did such a fine job on all that stitching...and those fabrics...perfect. I think the pocket and lining fabrics are fabulous. I wonder why interfacing is so hard to find there. It seems odd. Let us know if you need a parcel posting. In Perth, I guess we are almost the closest, right?